time: start – 9:45 a.m. ; finish – 3:30 p.m.
weather: Sunny with wisps and occasional clouds; hot! As meandering as the previous 30 kilometers of the river had been, this day would see us travel southeast in an almost straight line for the entire day. 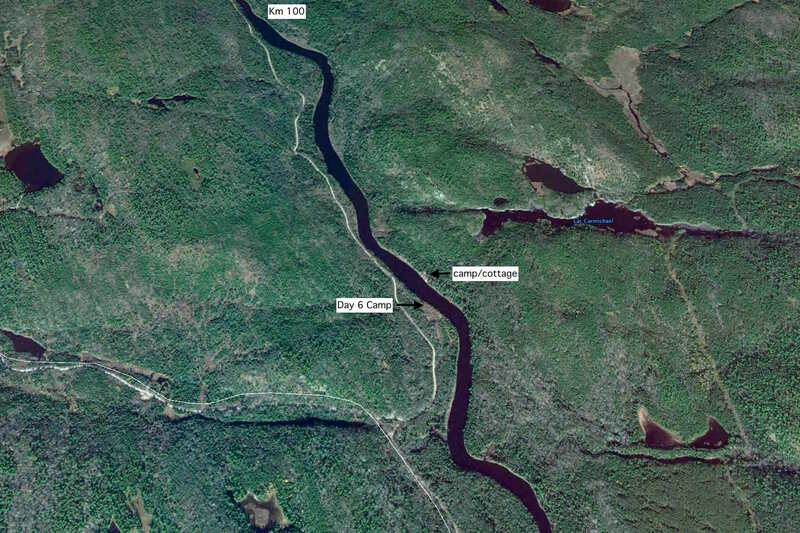 One portage – 475 meters on river right around Chute Gauthier – and a couple of easy CI rapids and that was it. 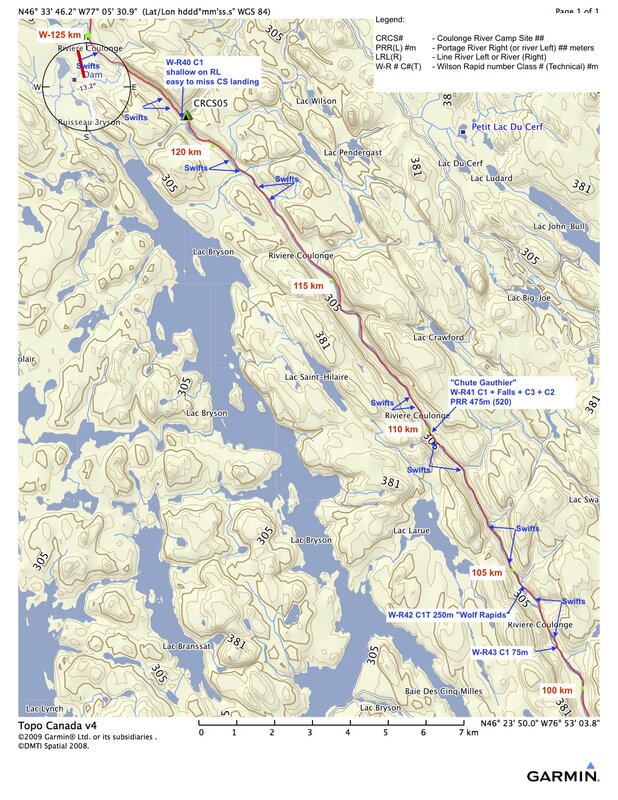 We had as our goal the campsite noted on the Wilson Map 8 at about Km 99. 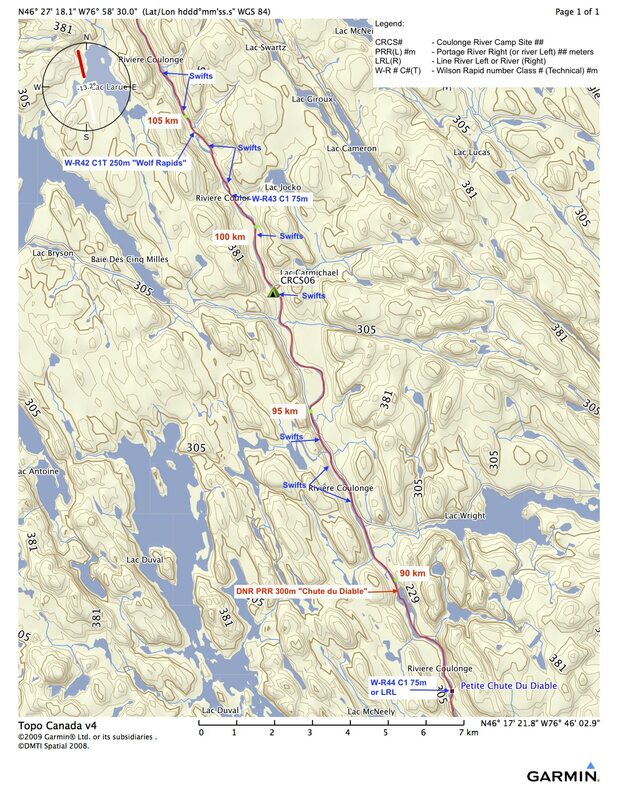 Other than a spot near the end of Chute Gauthier, there were really no other decent stopping points before our eventual campsite (and it was mediocre). 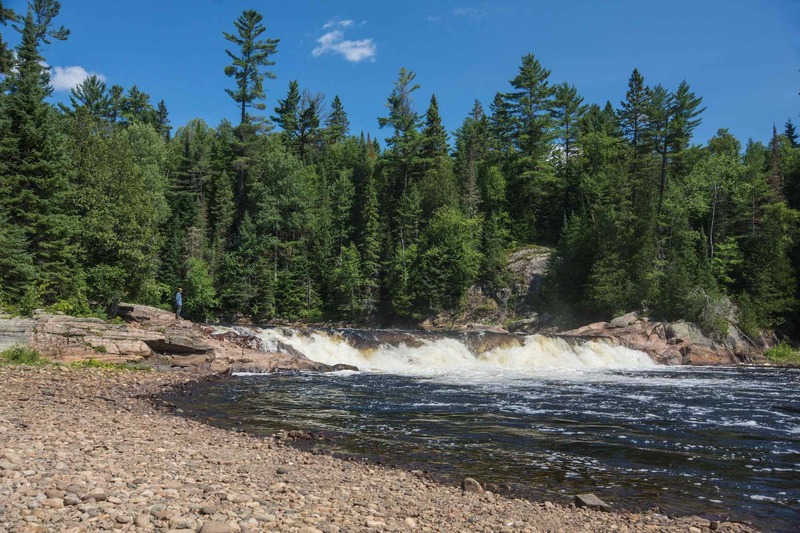 As for Chute Gauthier, we made use of the portage trail on river right after an initial set of CI rapids at the top. We were down at the bottom the second set of falls about forty-five leisurely minutes later. 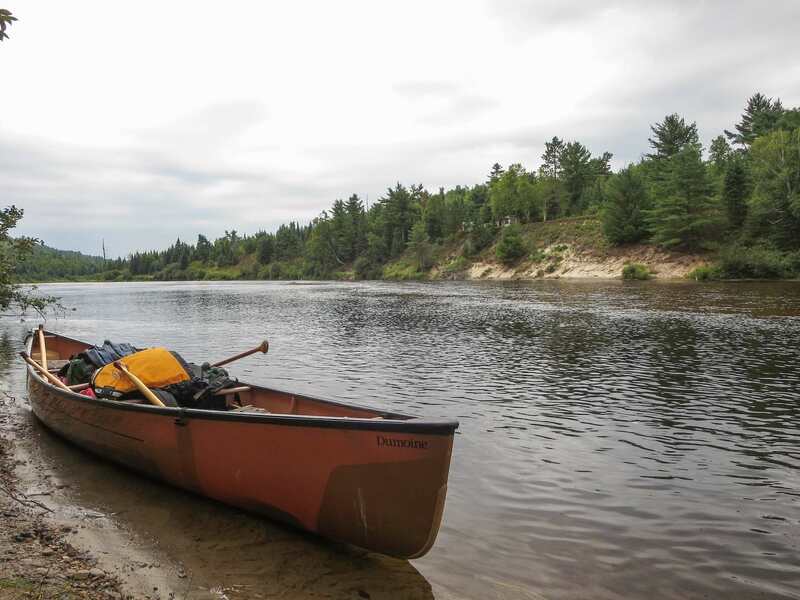 While it is possible to run and line certain sections, given the low water level those options seemed more trouble than just picking up the canoe and gear and getting it done. After the Gauthier Falls, the swifts and fast water made for a very nice average speed of 8 km/hr. 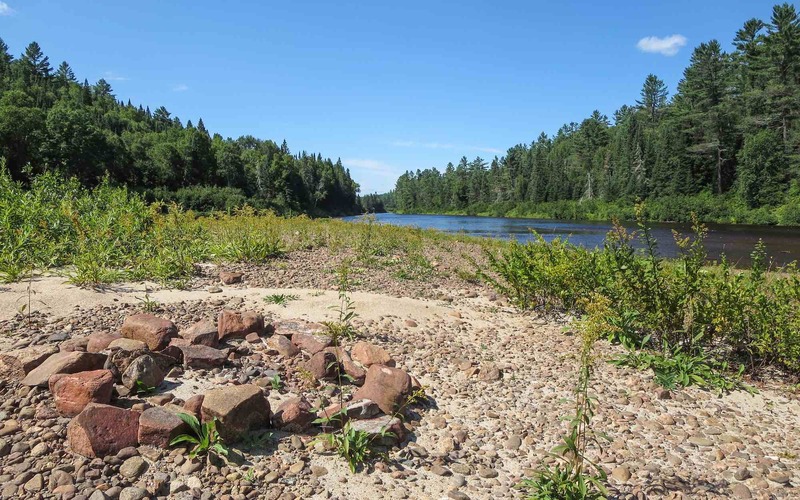 Past the CI Wolf Rapids and on to a possible campsite indicated on the Wilson map at Km 102 on the north end of an island. When we got there we found a sandbar. Thinking that the actual campsite must be on the island just behind the sandbar, we did a bit of bushwhacking to find it. 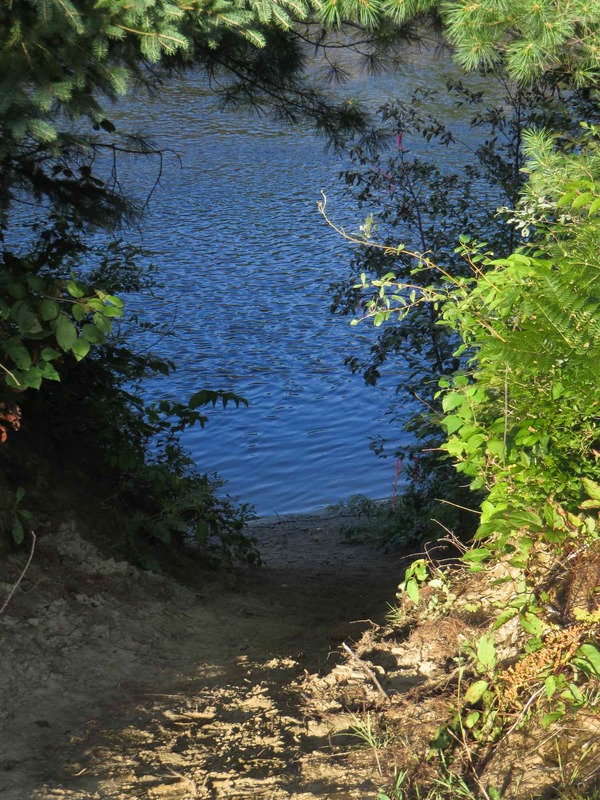 No trail- no clearing – no nada – we concluded that the campsite – such as it was – was the sandbar! The P which Wilson affixed to the tent symbol – we would only find out after we got home and checked out the legend page – stands for Poor, a fair assessment of the spot. It may be okay in an emergency; otherwise, you’d have to believe that better was just a bit further downriver! The trouble is that for long stretches of the Coulonge that sandbar is all there is to choose from. We went on a bit further, finally stopping at Km 99 when we noticed a sandy vertical gash in the otherwise green shoreline on river right. As we got closer the faded prospectors’ tape caught our eye. Across from the steep trail going up to the top of the sandy bank was a hunters’ camp/cottage. 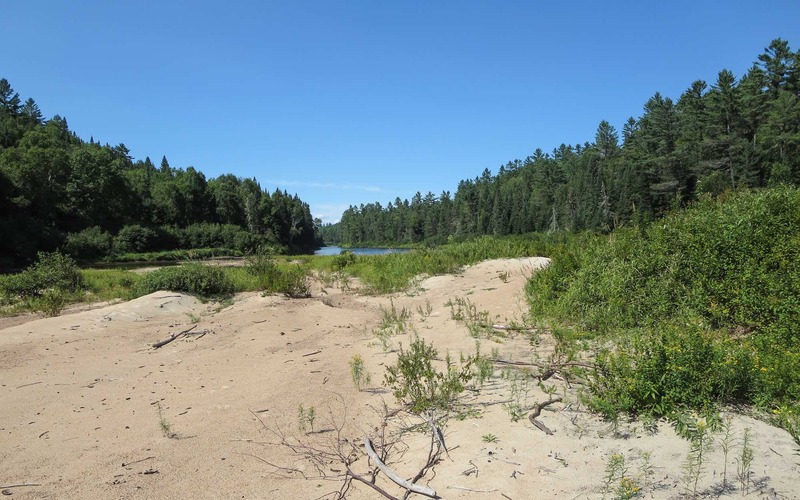 A fifteen-foot scamper up the 45º sandbank brought us to a flat open area that serves as a parking lot for the owners of the camp across the river. 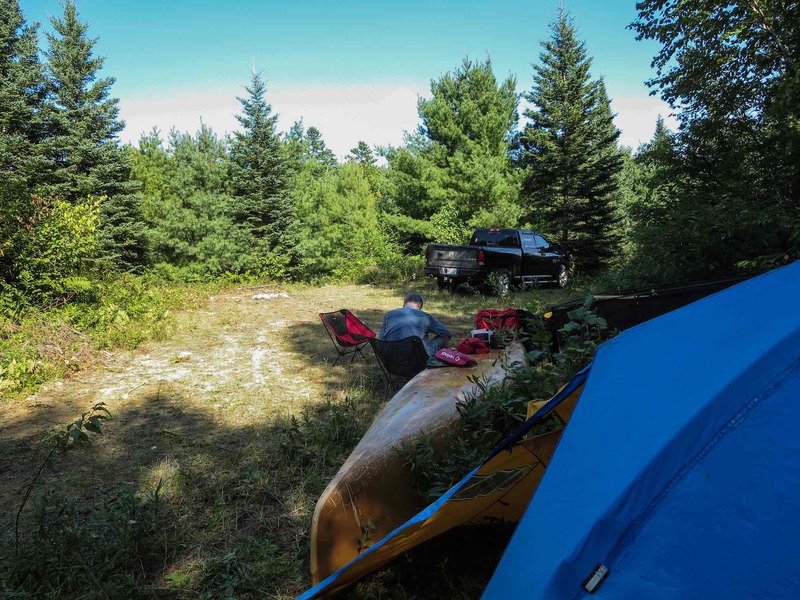 We weren’t thrilled to see that we would be camping at the end of a side road alongside a Dodge Ram 150 and a trailer. M for mediocre the Wilson map rates it. On the plus side, it is a flat, open space and it was better than almost anything else we’d seen this particular day. After our afternoon-long search for a nice campsite, it would have to do. 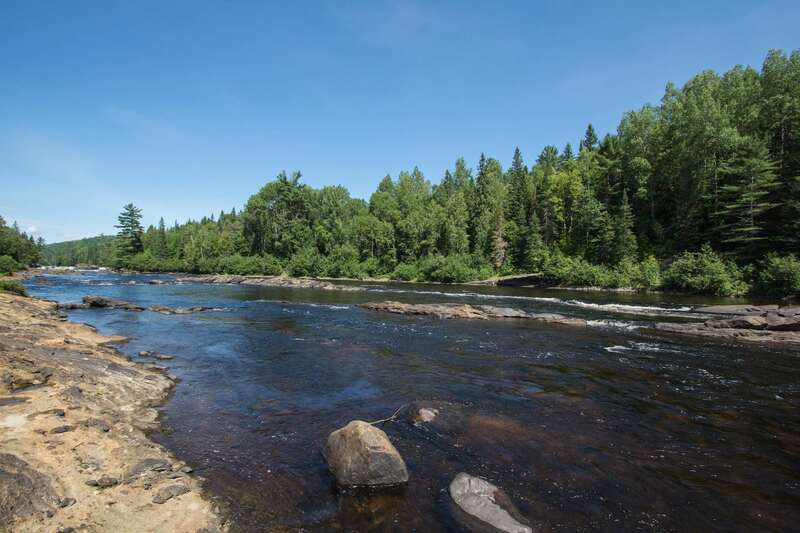 The lesson we learned here – and which we would apply for the last three nights of the trip – was this: on the Coulonge River the best campsites are in those bits of the river with rock outcrops and accompanying rapids. 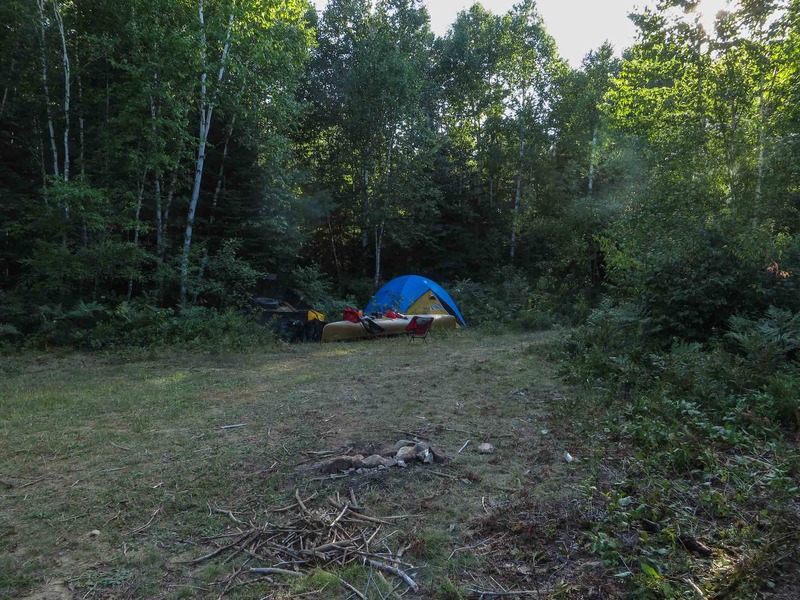 Occasionally we would focus on the sounds of the generator from the camp across the river and of the owner practicing his moose calls. We hoped for another sunny day as we continued our way down the river the next day. We had already picked out the bottom of a set of rapids as the target campsite! This entry was posted in wilderness canoe tripping. Bookmark the permalink.